The OB Town Council in a secret meeting in the Crafts Room. How innocent looking. A picture says a thousand words, they say. And so it does. We caught the Ocean Beach Town Council holding a secret meeting at the OB Rec Center the other night – Wed., Dec. 11th. Could see all of them through the screen of the window. 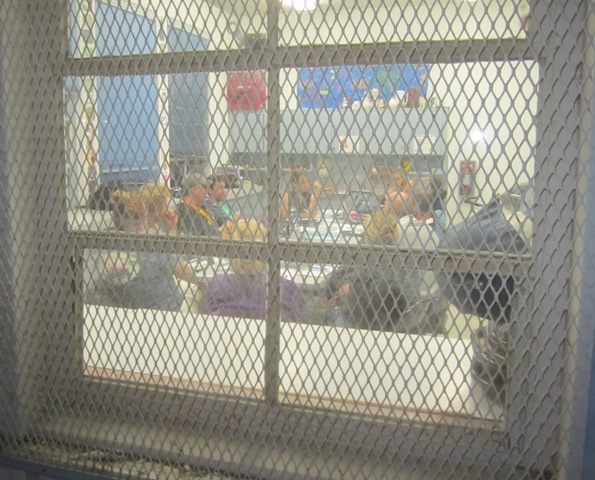 There they all were – plotting and conspiring – in the innocent looking “crafts room” at the center. We couldn’t hear what they were saying, but obviously they were plotting and conspiring on how to spend thousands of the dollars they made this past week on 70 needy Ocean Beach families. Imagine! The nerve of these town councilors – spending money on toys and food for others! Those schemers! How dare they meet in secret like that! Isn’t there a Brown Law or something like that forbidding deceptive gatherings in crafts rooms? The only thing going on in that OB Rec room was CRAFTY shenanigans! Ah, good one, “crafty shenanigans!” Obviously they’re playing craft games(?). How corrupt all this craft (?) They’re crafting their conspiracy. They don’t call San Diego America’s Finest City For Al Capone and Da Boyz for nothing.